One of the reasons people end up having stained glass windows installed in their homes or at their businesses is for privacy concerns. Unlike typical windows, stained glass is much more effective at giving people privacy while still letting light in! Do you have a window in your bathroom? A lot of people do, and they feel awkward when their neighbor might see them on the toilet or coming out of the shower naked. However, a stained glass window can eliminate the neighbor’s ability to easily see into your bathroom or other room in the house where you’d like some privacy. What about the windows on both sides of the front door? They help let light inside the house, but if they’re not always covered with window treatments (thus blocking light) passersby are going to see directly into the house. Where’s the privacy? These “sidelight” windows, as they’re called, should be stained glass, which not only gives the occupants privacy, but also adds some charm to an otherwise boring-looking window. 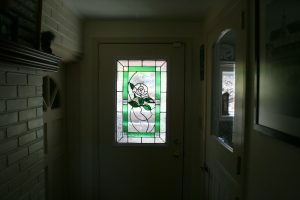 Indeed, stained glass can help the front of a house make a good impression on all who pass by it or walk up to the front door. Artistically, stained glass is interesting, colorful and “fancy looking,” in a good way. Do you currently have your windows covered using blinds? Do you know how hard those are to clean? Sure, blinds keep people from seeing into your rooms, so they’re good for privacy. But they sure do get dusty easily, and most people have no clue how to clean them, so they just let dust build up on them over time. Frankly, it’s easier to wipe down a flat stained glass window instead of having to deal with dirty blinds. Finally, stained glass is customizable and can be whatever you need it to be, looks-wise. For instance, use color or don’t, use textured glass with shapes and patterns or don’t, and/or use beveled glass to increase the amount of light in a room (since beveled glass refracts light) or don’t. It’s up to you! Why not call Cumberland Stained Glass today at 717-691-8290 and discuss your ideas for stained glass at your house or office?